Precious metals futures climbed on Friday but they dropped for the week. Weekly losses for gold, silver and palladium were their second in a row. One day after ending at its lowest price of the year, gold for August delivery edged up 20 cents, or less than 0.1%, to settle at $1,270.70 an ounce on the Comex division of the New York Mercantile Exchange. "Although prices have attempted to rebound higher [Friday], this has less to do with a change of sentiment towards gold and more to do with dollar weakness amid profit-taking," MarketWatch quoted Lukman Otunuga, research analyst at FXTM. Gold futures traded 0.6% lower this week after falling 1.9% last week. On Thursday, the yellow metal ended at its lowest price since Dec. 20. Gold prices are now 3% lower on the year to date. "Seventeen market professionals took part in the survey. There were 10 votes, or 59%, calling for gold prices to rise. There were five votes, or 29%, calling for gold to fall, while two voters, or 12%, look for a sideways market. Meanwhile, 2,276 voters responded in an online Main Street survey. A total of 915 respondents, or 40%, predicted that gold prices would be lower in a week. 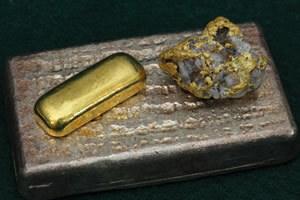 Another 796 voters, or 35%, said gold will rise, while 565, or 25%, see a sideways market." Elsewhere, silver for July delivery settled up 13.3 cents, or 0.8%, to $16.459 an ounce. Silver futures edged down 0.1% this week after dropping 1.6% last week. The precious metal is 4% lower on the year so far. July platinum added $10.10, or 1.2%, to $873.30 an ounce, but logged a 1.6% weekly decline. Palladium for September delivery rose 80 cents, or less than 0.1%, to $946.40 an ounce, but plunged 3.6% on the week. The pair is lower on the year to date with losses of 6.9% for platinum and 10.8% for palladium. Gold gained $3, or 0.2%, to $1,269.15 an ounce. Silver rose 18 cents, or 1.1%, to $16.425 an ounce. Platinum added $1, or 0.1%, to $867 an ounce. Palladium declined $6, or 0.6%, to $956 an ounce. In LBMA results for the week, losses reached 1.3% for gold, 4.6% for silver, 3.5% for platinum, and 3.9% for palladium. United States Mint bullion sales were mixed this week with silver coins higher and gold coins lower. 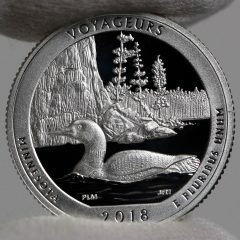 A CoinNews photo of a Voyageurs quarter. 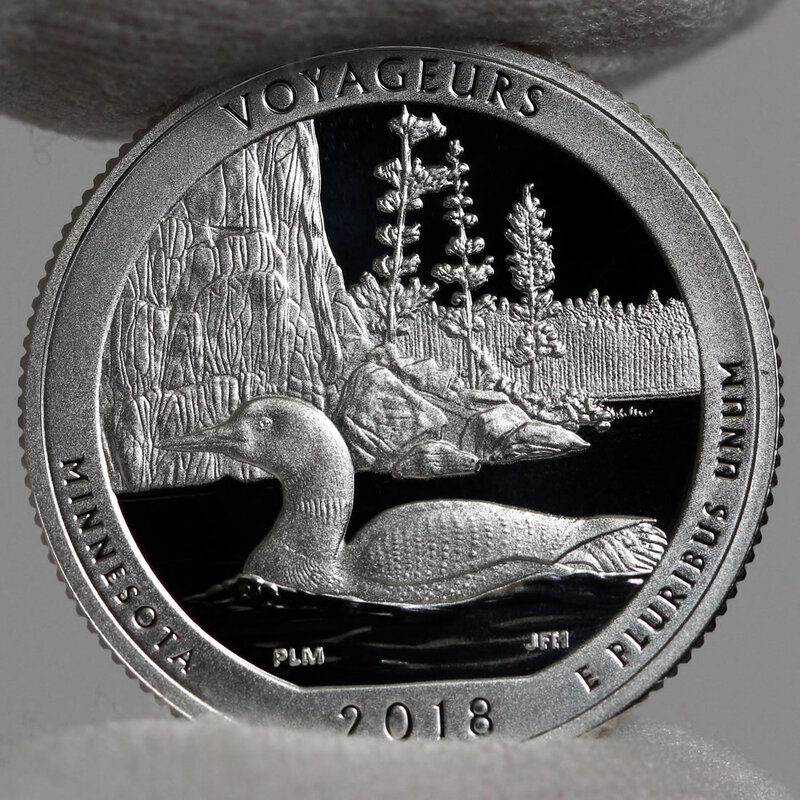 The U.S. Mint this week started accepting orders for its 5-ounce Voyageurs America the Beautiful Silver Bullion Coin. It shares the quarter’s designs. On Monday, the U.S. Mint released its third 2018-dated 5-ounce bullion silver coin. The piece depicts Voyageurs National Park in Minnesota — just like the companion quarter. It scored first day sales of 16,100 coins and climbed Tuesday to 28,900 coins where it has remained. No 5-ounce coins sold in the previous eight weeks. American Silver Eagle sales moved up by 215,000 this week after rising by 25,000 last week. Gold bullion coins rose by 2,000 ounces this week after they advanced by 6,500 ounces last week. All sales last week came from American Gold Eagles. This week, splits included 1,000 ounces in American Gold Eagles and 1,000 ounces in American Gold Buffalos. Would someone who has seen the 2019Red Book explainthe section on American Eagles?